1. A butterfly cruelly pinned to a cork by neelamani sutar : the story is cute, it ends with a lesson which is quite usual.a detailed description and a better flow of emotions could have made the story better. 2. A glowing regret by swatii chandak : the vocabulary is good, the story could have had better inputs. It leaves you with a message, the story is embellished with some heart touching lines. Overall it was a nice story. 3. A singleton love story by akansh ashok malik : this story is emotional and is marked with some hard touching lines. It is a feel-good-type of story..altogether it was a nice one.. the editing could have been way better. 4.destiny's masquerade by mahua sen : this story could not have any better. It will strike straight to your heart, an unconventional story of first love, this one would probably make you cry. The language is at its best ....lovvveeeeeddddd it ! 5. The enchante by akash rumade : it is a heart touching story which ends unexpectedly adorned with simple yet unique characters. The story was a very good one..
6. If only by aditi sahu : it is one of the best story in the entire anthology. It takes you to the world which the author effortlessly creates. At some momets you laugh and at some you will cry, but you will love it..
7. Is this love by smriti kumari : the story is sweet and nice, it tells a lot of first love and its revelations..it could have been better. Also the editing could have been better. 8. Love is sacrifice by sunandra bhadra : the story is cute, it's also about first love.. it is more of a fairy tale romance than a realistic love story, but stories are mean't to be like that . Aren't they? 9. One sided love by shubhashish goel : the story could have been a lot better . 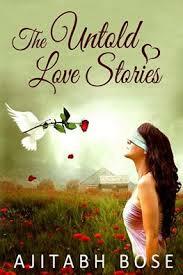 The elements of a love stories were very less, the editing could have been MUCH MUCH better. 10. Love, determination and dedication by shailesh pyasi : the editing could have been far far far much better. It has less elements of a love story, it could have been better. Never the less it was a good try !